We'd had apples and pumpkin already for our pies, yet I still had the lingering twitch to make another. One with walnuts. And maple. As you do, this time of year. For my friends in the United States, I'm here to give you a head start. For everyone else, I'm here to give you Maple Walnut Custard Pie. While I'd boldly declared dessert plans figured, I've gone and improved upon the theme with a real contender for shared billing with that ice cream. I made this pie on Sunday, a week after our Thanksgiving and forty-some-odd days before the American counterpart (there's your head start, pals to the south — you can thank me later). Ice cream was actually at the beginning of this. That's what got into my head, this funny memory of a past conversation with a friend, detailing the merits of Butter Pecan ice cream versus Maple Walnut. (And it's a good friend who both puts up with, and ardently participates in, such arguments.) Our debate made me think of my father, as it always does — not only because Maple Walnut is usually his favourite, but also because he began sugaring the maple trees on his property the same winter my eldest son was born. He tapped a few trunks and he, with the help of my eldest nephew, harvested the sap. They made quite the picture, ferrying buckets full of clear liquid from the forest to big pots that sat atop a wood-fed stove. There the sap bubbled and reduced, going golden then amber and sweet. In those first years, the stove had a shorter stack, so the resulting syrups were touched with smoke. The syrup smelled, and even better tasted, of crisp air and campfires. It was the nicest I've ever had. So I made this pie, with my father still in mind, and my mother-in-law too, because she likes both butter pecan and maple walnut, and Sean's grandmother as well, because she makes the finest Butter Tarts and this pie reminds me of them — a subject we should stick a pin in and come back to later. This pie is an old-fashioned looker, made by hand. You can consider it a rustic variation on pecan pie, a brawny northern cousin that's caramelly sweet but unexpectedly subtle. A bit flannely, with a generous smile. That sort. You'll see there's two brown sugars in the filling. I thought all dark might be too heavy, and all golden might be too anemic - but using only one or the other would be perfectly fine in a pinch. The one thing can't be fiddled is the maple syrup, which needs to be proper stuff. Choose the grade you're fond of, or if you come across some smokily intense maple syrup, then that's the one to invite along. It'll hang around with the toasty-edged walnuts and get on like best mates who to talk about ice cream. Their companionship is both complimented and tamed by the boosted creaminess brought by a swirl of evaporated milk (I know!) stirred in with the eggs. And the oats! Those oats, they're tricky misters, and the subject of quite the side-eye as they went into the bowl. But oh, what a difference a soak and a bake make. 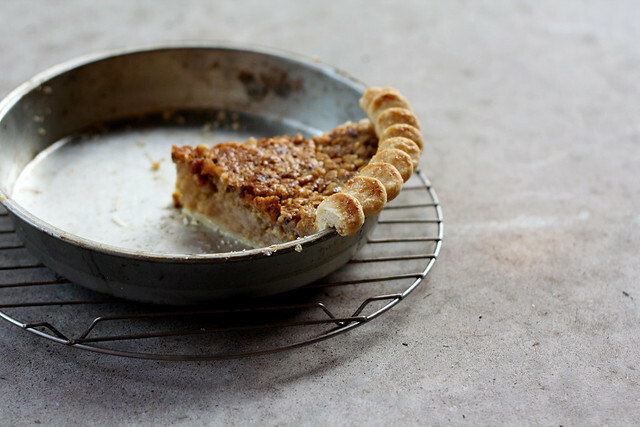 The oats fluff up, lose their form and give the pie a pleasant density, setting the custard soft and pudding-like, underneath the cobblestone crust of walnuts that float to the top and go crunchy. In secure belief that this is a pie you'll like, I'll see about asking Dad for an extra-large syrup harvest come spring. I'll thank him later for that. Quite possibly with pie. Adapted from The Egg Farmers of Ontario. The ingredients are pretty much the same as the original; the method is where things change. Here there's the instruction to pre-bake the crust. And, when almost done, the warm pastry gets a thin coat of egg white, which is then baked for a minute until shining. These added measures maintain some of the crust's crispness, which is nice against the smooth filling. It also makes the pastry edge extra pretty. Preheat an oven to 400°F (205°C). In a dry skillet over medium heat, toast the walnuts until golden and fragrant. Remove to a bowl and set aside. In a large bowl, whisk together sugars, oats, evaporated milk, maple syrup, melted butter, vanilla and salt. Prick the pastry all over with a fork. Cover with foil and bake for 15 minutes, pressing down any puffed areas with the back of a spoon gently if necessary. Remove the foil and bake for 10 minutes more, the crust should be starting to look dry in places. Remove the crust from the oven, brush all over with a thin coating of the egg white, and sprinkle edge with granulated sugar, if desired. Return to the oven to bake for 1 minute more. Set aside the crust to keep warm, and reduce the oven temperature to 350°F (175°C). Stir the toasted walnuts into the filling, along with the whole eggs. As soon as the oven reaches temperature, pour the filling into the still-warm crust and bake until puffed at the centre and set with little wobble, about 60 minutes. Transfer to a baking rack and cool completely before slicing. Makes one 8-inch pie, serving 8-10. I changed the size of the pie, as the greater ratio of filling to pastry made for a more satisfying bite. A pâte brisée recipe for a 9 or 10-inch pie will allow for the extra depth of a 8-by-2-inch pie plate. If using a store-bought pie shell, which are usually 9-inch, reduce the cooking time to around 40 minutes.